Stobhill Councillor, Ian Lindley, with Kerry Moore, Land Manager at Barratt Homes North East, and Brooke Burgess, Director of The Northumberland Community Enterprise. Barratt Homes North East, is supporting the Morpeth community by offering careers through the Northumberland Community Enterprise iLearn project. The Enterprise, based on Shields Road in Morpeth, offers opportunities for disadvantaged people, tackling issues such as unemployment, digital exclusion and social isolation. The house builder, which has recently launched a new development in Stobhill, Morpeth, is currently offering roles in its construction team through adverts displayed at the Northumberland Community Enterprise Office. The roles include a store person and forklift truck operator. 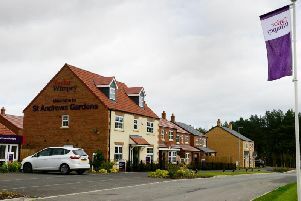 Kerry Moore, land manager at Barratt Homes North East, said: “We are always keen to give something back to the communities in which we develop and having recently launched our South Fields development in Stobhill, the Northumberland Community Enterprise really stood out to us. Brooke Burgess, Director of The Northumberland Community Enterprise, added: “We work hard to offer a range of opportunities to disadvantaged members of the Morpeth community. “This includes help with employability, including CV writing and support with job applications.